Microsoft Teams is revolutionizing corporate communication and while most Office 365 subscribers have access to it, they're not using it to its fullest potential. With Ready, Set, Go, Teams training you'll be able to roll out this powerful platform to your entire office and start communicating, collaborating, and conferencing better this year. 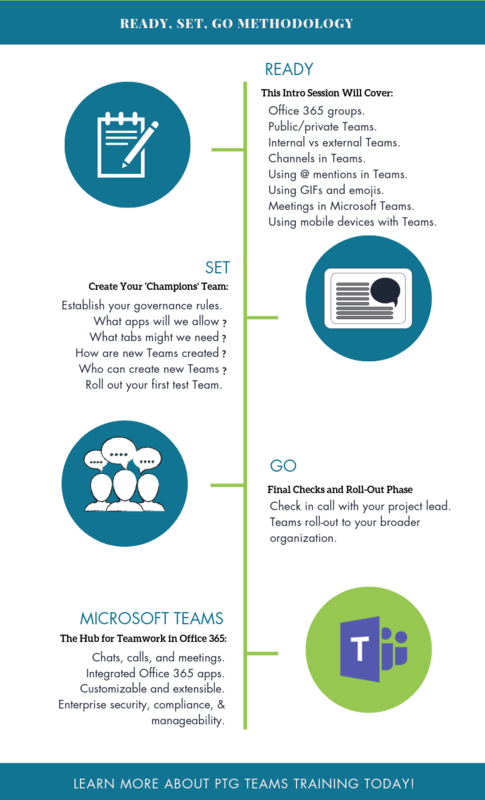 We have an infographic with tons of statistics and helpful information to show you how Teams is improving the work of thousands of organizations already. Fill out the form to the right to reserve your spot. PTG is a Better Business Bureau accredited, outsourced IT support provider based in Greenville, SC. We help businesses use technology to increase productivity and keep their information secure. We’re business people first – and IT providers second. We've helped hundreds of businesses all over the world migrate to the cloud and were recently named 2016 Microsoft Greater Southeast Cloud Partner of the Year - for the third time.